Although one of the most widely read evangelical authors of the nineteenth century, Ryle's writings lost influence after his death. The world had moved on, as was supposed. Then, fifty years later a 'rediscovery' began. Research on his life was accomplished by able authors, and from a new wealth of material Iain Murray has put together a compelling biography. Ryle believed in definite doctrine, in a message which does not adjust to the times, in revival, and in the living Christ. He knew that all the great turning points of church history have been attended with controversy, and that 'there are times when controversy is not only a duty but a benefit'.J.C. Ryle's life is convincing evidence that Christianity stands or falls depending on its relation to the word of God and to the Holy Spirit. That he is being read widely again at the present time gives hope of better days. 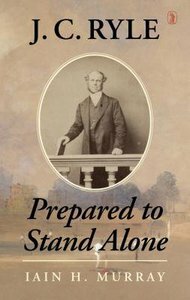 About "J.C. Ryle: Prepared to Stand Alone"
Customer Reviews For "J.C. Ryle: Prepared to Stand Alone"
I usually find Murray's work engaging, for which parts of the biography surely was. I was fascinated to learn of the tension between Ryle's evangelicalism and Reformed theology with his position of prominence within the Anglican church; it can be nothing other than the grace of God that preserved him in this position. I have come to love Ryle's writing and in particular, his writing style; he is both deep in his theology, but equally, his writings are accessible and most applicable. I was also moved in reading that his first two wives passed away and his committed love to both and his blessed third marriage, especially with the many children he had. I did however, find some chapters to be drawn out and filled with historical notes, while giving some background to the times and events of Ryle's life, made for heavy reading especially at the beginning of the book. I would also have liked more development in Ryle's unusual position in the Reformed world, in that he believe that Israel was distinct from the Church and that there would be a literal fulfilment of Israel being re-established as per prophecy. In saying this, I would still recommend this book as an introduction to Ryle, someone who all Christians should read in their spiritual walk (especially his commentaries on the gospels). Iain Murray paints a brief but engaging biography of the 19th century Anglican minister J. C. Ryle. He is careful in his selection and recounts to give readers an outline of his life, the way God used him and the lessons Ryle has to teach the church today. Murray also introduces readers to Ryle's works. Modern day Christians have much to learn from Ryle, and this biography is an excellent place to start.